Textbooks upended as researchers show that DNA naturally fluoresces. For decades, textbooks have stated that macromolecules within living cells, such as DNA, RNA, and proteins, do not fluoresce on their own. Technology instead relies on special fluorescence dyes to enhance contrast when macromolecules are imaged. Now, a study from researchers from Northwestern University shows that macromolecule structures in living cells do, in fact, naturally fluoresce. The team state that their findings could open the next frontier of biological discovery by paving a new way for label-free, super-resolution nanoscopic imaging and expanding the understanding of biological processes. Previous studies show that fluorescence is used in the life sciences generally as a non-destructive way of tracking or analysing biological entities. This includes DNA, designated as non-fluorescent, whose four different chain terminating bases historically has its own specific fluorescent tag. It is known that many biological molecules have an intrinsic fluorescence that can sometimes be used without the need to attach a chemical tag. This is useful as intrinsic fluorescence can change when the molecule is in a specific environment, so the distribution or binding of the molecule can be measured with greater accuracy. 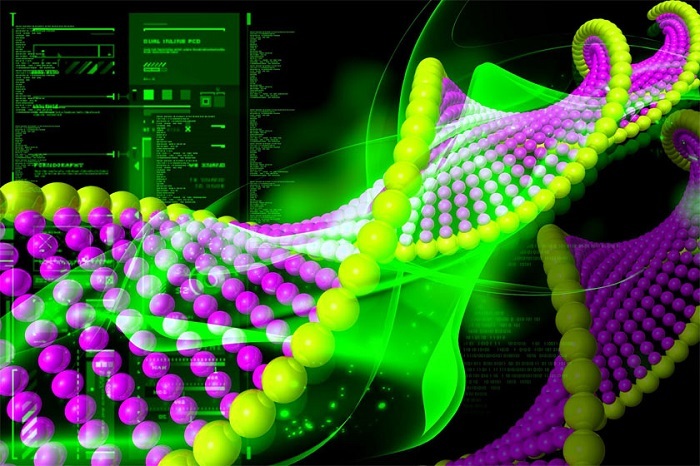 The current study shows that DNA does, in fact, have intrinsic natural fluorescence. The current study shows that when illuminated with visible light, the molecules in DNA get excited and light up well enough to be imaged without fluorescent stains. Results show that when excited with the right wavelength, the DNA autofluoresces more than it would with the best, most powerful fluorescent labels. The lab explain that this is ideal because staining is toxic, making imaging less precise. The group state that this toxicity makes it tricky to get an accurate image of the active processes in living cells because they die immediately after the application of fluorescent tags. They go on to add that there are special dyes used to image living cells, however, these just cause the cells to die slower. The team surmise that their findings suggest the reason no one spotted the fluorescence before is because the molecules were in the dark state, a condition in which they do not absorb or emit light. They go on to add that because DNA spends so much time in the dark state does not mean it never emits light. For the future, the researchers state that as autofluorescence can sometimes be problematic when discerning salient structures, the next challenge will be to overcome this, harnessing this natural highlighter to learn more about the overall structure of DNA.